For centuries, wrought iron doors were known for their superior craftsmanship and incomparable security. Homeowners could commission foundry and iron artisans to build custom doors to match the trim-work and window treatments of their homes. 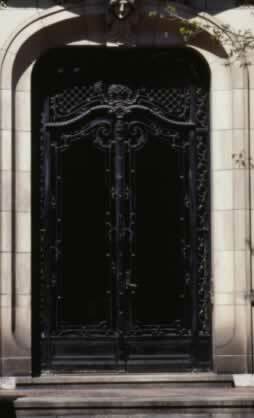 These double doors show the finery work and scrolling typical of metal doors in American architecture. Metal doors stymie intruders by their very nature, and contemporary steel and iron doors are build to not only protect your investment, but add insulating qualities as well. As the sun moves across this metal door by day, the ornamental work illuminates in contrast to the gray stone exterior. Meanwhile, the doors obscure direct view into the home's interior, offering line-of-sight protection from lingering by-standers. The wrought-iron theme can also be carried through to interior doors, wine-cellar doors, and window treatments.